With 6 days of bike racing, pharmacy it was an adventure as always. The downtown prologue was as fast as can be, prescription with super fast times over the fresh smooth pavement, skincare 1.7 miles in 3 minutes flat. You were at the turn around before you knew it, and the pain didnt really set in untill you could see the finish line. The most exciting part of the day was when a team mate ran over a traffic cops cone heading into the team parking, the cop wasnt very happy. 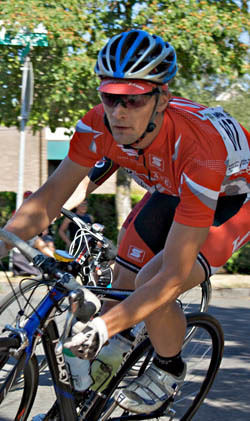 The 2nd day, and first stage, was the Mt Tabor Circuit race. It was a fun course, but with 150 guys on the pave, the 180 degree hairpin at the top of the short hill was so slow that guys were track standing and unclipping to drop anchor as they went around. Despite a totally stand still at the top, the pack still managed to average 31mph as we flew through the rest of the course at top speed. The ride back to the host house included a stop at a pizza place to order it to our house. Perfect. The circuit at cooper spur-painfull. Its about 45 minutes of uphill, with a 15 minute fast descent. Id talk more about it, but the only part that i really can remember after starting the race, was the tail end of the descent when i was recovered from the uphill…its all a little blurry. Mt hood has the best TT course ever, a climb, great views, fast downhill, a tunnel, and a bike path on the edge of a cliff. Its hard not to take the time to enjoy the view. A slight tail wind made the times a bit faster than last years. Rory Sutherland threw down, 25 seconds faster than his closest competitor Ben Jacques-Maynes. This years Wy’east RR was hard. Mostly because we didnt have an hour of downhill, it was just up. Starting in the desert and ending at Mt hood, we rode through desert, trees and snow. The first hr was off the hook, with a lot of guys attacking trying to get off the front. I was eventually in a break off the back unfortunately, and it was a long day of pace lining. It was nice to move from 90+ degrees into the snowy mountains where it was 45 degrees, although there was a lot more time spent in the heat than in the cool. The crit is a great course, with a fun downhill turn, fast stretch through the bottom and gradual uphill through the start finish. I didnt get started near enough to the front of the pack, so getting anywhere worth while took a lot of work. There was eventually a break off the front which stuck, and came down to drag race to the finish for them with Andrew Pinfold of Symmetrics taking the win. After a blazing TT and good riding elsewhere in the race, Rory Sutherland took the overall GC with Darren Lill in 2nd and Ben Jacques-Maynes in 3rd. A good week of riding.